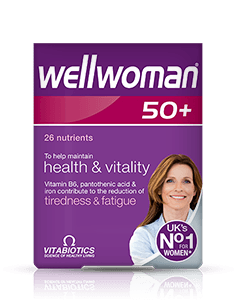 Wellwoman Original is the original vitamin developed just for women and has been formulated for the demands of modern life and to give support to the areas of health which are of most relevance to women. The comprehensive daily multivitamin contains a wide range of nutrients and trace elements including Evening Primrose and Starflower Oil. 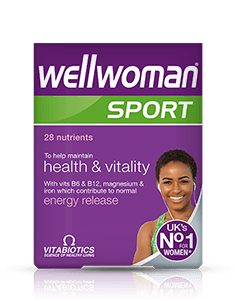 Wellwoman contains a spectrum of micronutrients for all-round nutritional support including vitamins B6, B12 and iron which contribute to normal energy release. Folate, pantothenic acid and vitamin B12 also contribute to the reduction of tiredness and fatigue. 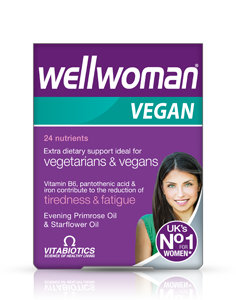 Evening Primrose and Starflower Oils are included in Wellwoman along with a wide range of nutrients and trace elements to support the areas of health which are of most interest to women. The formulation contains vitamin B6 which contributes to the regulation of hormonal activity, plus iron which contributes to the normal formation of red blood cells and haemoglobin, an important consideration during the monthly cycle. Also includes 400mcg folic acid which contributes to maternal tissue growth during pregnancy which is important if you're planning a pregnancy or there's a chance you might get pregnant. Looking after your immune health is important throughout the year, not only in the winter months. Wellwoman includes selenium and zinc which contribute to the normal function of the immune system. Vitamin B6 and B12 also contribute to the normal functioning of the nervous system. Most of us would like a little extra support for our skin, hair and nails. Vitamin C is included in the formulation as it contributes to normal collagen formation for the normal function of skin. Collagen is the substance that gives skin its elasticity. Plus biotin, niacin (vit. B3), zinc and riboflavin (vit. B2) all contribute to the maintenance of normal skin. Zinc also contributes to the maintenance of normal nails and biotin contributes to the maintenance of normal hair. Based on years of international clinical research, the comprehensive Wellwoman formula is well balanced, even including the exact level of folic acid recommended by the Department of Health for women from the first day of conception to the twelfth week of pregnancy - because women of child-bearing age sometimes need nutritional support before they even know they are pregnant. 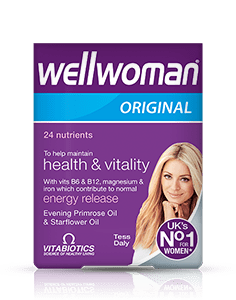 Wellwoman Original is available in the UK from Boots, Superdrug, Tesco, Sainsburys, Asda, Waitrose, supermarkets and pharmacies, health stores including Holland & Barrett. Alternatively order online here. "Wellwoman vegan a complete vitamin ideal, very impressive." "Have been using your Wellwoman products for years, with great results. I recently went vegan, and hoped one day that you might make a vegan version of these great vitamins I had been taking for so long. And you have! Will be ordering these from you every month without fail. Thank you so much for thinking of the vegan movement and ensuring I can still enjoy the best vitamins that are on the market"
"I just want to say how amazing these tablets have been, I was taking Wellwoman original but with being late 40s I was finding these wasn't enough, I'd tried various different brands etc, sage, oil of evening primrose, black cohosh, nothing was working and sister was on Menopace Original and said how good they were. I thought I'd try the Menopace Plus. These really are amazing and never miss a day." "Hi, I just wanted to let you know Wellwoman Max vitamins have helped me very much. 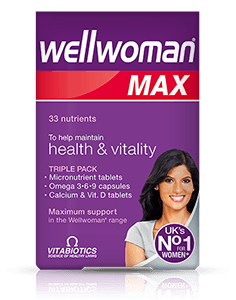 ....having two small children and having just started a new job so decided to try Wellwoman Max. They've helped enormously"
"Amazing, life changing, amaziiiiing for real, thanks alot "
"Ever since I started using Wellwoman Plus 3-6-9, I have never been happier in terms of my energy levels and feeling good. if it wasn't for this, I would have lost it to my stressful routine. Can't do without it anymore." "WOW! WOW! WOW!.... ABSOLUTELY LIFE CHANGING! My 76-year old mother has turned into an amazon woman literally overnight! From not being able to walk for longer than 10 minutes at a time or move her arms very well...she has now painted the whole of her kitchen and hall! ?? Just gave her another three packets....she really could give wonder woman a run for her money! " "Just wanted to let you know l have just finished my first box of Wellwoman Max . They have totally altered my life for the better in just about every way l can think of ! Sleeping much better, energy levels unbelievable, the list goes on . Thank you so much for inventing them ! ! ! By the way, l was 71 last week." 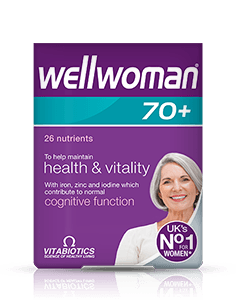 "A couple of months I began taking the Vitabiotics Over 70 supplement for Women. I could not believe how quickly I found I had more energy, wanted to do more things and am finding life much more attractive all round. I will certainly keep on with this daily capsule. Thank you very much." "Since I have been taking Wellwoman 70+ I feel really well. I have been taking this supplement for a couple of years and I really think they help, together with a good diet, to help keep me healthy!!!" "I've taken Wellwoman capsules for 3-4 months, my complexion generally looks clear and bright! Now I don't even need to wear foundation! " 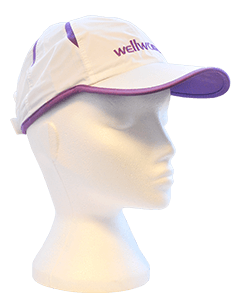 " Your Wellwoman Original seems to be effective in helping my monthly cycle. So far so good and thank you. " "I am a 40 year old who has been using Wellwoman for the past month. I would like to say it has certainly helped me a lot, and I have felt a difference in my energy levels. I will most definitely recommend this for my friends. Thank you Wellwoman." "I introduced wellwoman 50+ to my mother and wellman 50+ to my father. They have stopped complaining of dizziness and stiffness in their wrists. Also I don't experience the severe knee problem I used to have depsite constant visits to the physiotherapist. Am thankful that I discovered these products. " "I love the product. I had a miscarriage 4 months ago and my Dr advised me to wait 3 cycles before ttc. So while waiting for 3 cycles i started taking Wellwoman capsule everyday. And today i took pregnancy test and it came out positive. My husband and I are very excited so we are going to see my obgyn for another confirmation. Thank u very much for this product it helps a lot not just my skin and nails but also my well being. I will recommend this products to all my friends. " "I am so happy with this vitamin (Wellwoman). I was recently travelling in Australia and couldn’t find them in the shops which was disappointing. I have found your website and have recommended you to all my friends. These vitamins do not cost too much and has the perfect balance to help me keep my balance. Thank you." "I am just writing to say just how much I have benefited health wise from taking the Wellwoman supplement. It’s amazing. I am 45 and have had various tablets which were not as effective as Wellwoman. 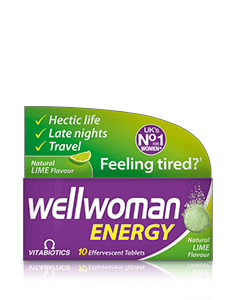 My colleague said that she felt so much better after taking Wellwoman- she had taken them for a month at a time so I thought I’d give them a try. These capsules really are the answers to my prayers. I was really getting very down as the time of the month approached and now I just sail through it. Thank you so much for making this product available, it’s brilliant!" "I have been taking Wellwoman Fizz all week at my desk and have to say that I am feeling the effects on my energy levels already. I will be recommending this product to my Mum , sisters and all my friends at work. Many thanks for such a great product." "This is the best product on the market for women. I am diabetic and 4 months ago underwent a hysterectomy. I decided to take action and on a daily basis for the last 2 months i take wellwoman fizz in the morning and after breakfast take wellwoman multivitamin. Very pleased with the product and all women in early forties should know about It. " "I have been taking Wellwoman multivitamins for 5 weeks, I cant believe how my nails have grown in this time and look very strong compared to how they used to be. I and decided to take a course of vitamins especially with my lifestyle...avoiding healthy foods for snacks, not enough fruit etc. So, I chose this multivitamin and also take a cranberry capsule every day for helping to have a healthy bladder! I feel as though they have made a difference so will continue to use them. Also a daily walk makes you feel good as well." 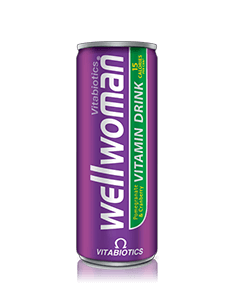 "I recently tried a course of Wellwoman capsules and they are fantastic! I cant say that I have noticed much physical difference, but it is as if I have just 'woken up'. I am so much happier, am more in love with my boyfriend and am so much more content than I have ever been! the future seems bright. thanx "
"I have been taking wellwoman capsules for a little over a month now I just want to say thank you, and please don't stop making them. " "Just wanted to drop you a line to say how enormously grateful I am for your Wellwoman capsules. A few weeks after starting on Wellwoman capsules I felt great, and have done ever since. Thank you so much. Kind regards"
"Bought wellwoman fizz recently and have already been taking wellwoman caps for over a year now as well as my mum and sister and found the fizz to be fantastic, bought two packs although I gave one to my neighbour to try and she is now taking it as well. I also recommend these to all my customers." 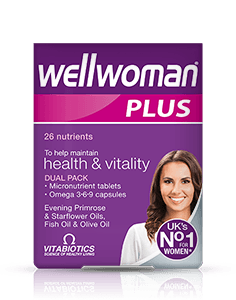 "I was recommended Wellwoman - Vitabiotics by friends having tried for a second baby for over a year. Within one month of taking it I am now a mother to be. I feel it had a lot to do in preparing my over-stretched, over-stressed body for conception. I am now recommending it to friends all the time. Excellent product." "I use the product Wellwoman & intend to continuing using the product; since it is beneficial to my health. " "I spent ages looking for a supplement that would give me the right combination of vitamins and minerals. Very pleased when I found Wellwoman." Always read the product directions before use. Do not exceed the recommended intake. As with other food supplements seek professional advice before using if you are pregnant, breastfeeding or suffer from food allergies, and consult your doctor or pharmacist if you have an underlying medical condition. Vitamin supplements are not intended to treat or prevent any disease. Food supplements must not replace a balanced and varied diet, and a healthy lifestyle. Do not use if you are allergic to soya. This product contains iron, which if taken in excess may be harmful to very young children. "My day doesn’t begin until I’ve taken my Wellwoman, to help support me for the busy days ahead"